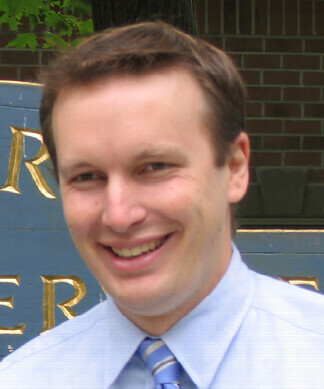 Today, the Chris Murphy campaign reports that they raised 331 in the 4th quarter of 2007 bringing the total amount raised in 2007 at 1.4 million with 1.2 million on hand. On the other side of the political aisle, at the end of the day Friday Republican challenger David Cappiello's campaign reported $131,133.33 raised in the 4th quarter with a large chuck (60,707.33) being PAC money primarily from the Challengers Helping Obtain the Majority Program (CHOMP) fundraiser. bringing his total to 397,685.33 for 2007. I was going to do a comparison of Cappiello's numbers to Murphy's 2006 figures when he ran against Nancy Johnson but Gabe at CTLP beat me to the punch. At this time in 2006, Murphy was reporting that he had raised $422k (which is more than $397k) for the cycle-to-date, had $382k (which is more than $238k) on hand, and had spent only $38k (which is less, much much less, than $161k) for the cycle to date. Focus on that last number for a second - Cappiello somehow managed to spend about three times more in Q4 than Murphy spent in all of 2005! He spent about $100k to raise about $130k - putting only $34k in the bank! And, as conncheck notes above, a little less than half of the contributions came from CHOMP, leaving only $70k from individuals (for comparison's sake, follow the link in this comment to see that Murphy raised about $125k from individuals in Q4 2005 and about $40k from PACs). There are a lot of ways to spin this, but none of them are particularly good for the Cappiello campaign - which is why the numbers were posted after business hours on a Friday. This week, a local resident named James C. Whiteside contacted me and wanted to know if I would publish a report he was working on regarding illegal immigration in Danbury. Today, I received his write-up and it's a wonderful piece of work that covers many of the same points I've raised in the past (i.e. John Tanton organizations, Lou Dobbs misinformation). It's my honor to share this informative piece with everyone. James, the floor is yours. The apparent tendency of the Common Council to go forward with an unscrutinized local police-ICE agreement appears to be a means to avoid responsibility for its effects. They can claim they “had no idea” how brutal it would be. Some members of the Council seem unwilling to consider the justice issues of any such agreement aside from its ‘illegal’ aspects. Their propensity seems to be to run with the ‘sky is falling,’ Chicken Little hysteria about this immigration. Many seem to take their direction from News-Times letters-to-the-editor writers who claim there is a monstrous ‘invasion’ of the country producing overwhelming cost. This is particularly interesting because none of these letter writers appear to have complained about the truly overwhelming costs of George W. Bush’s despicably invented war in Iraq and the economic troubles that have come with it. The trouble here is that humans don’t like to feel bad, stupid or ‘taken.’ So there has to be some victims found to be sacrificed for American face saving. Low and behold, the Latino immigrants are right here and handy! This can only lead thoughtful observers to the educated opinion that ‘illegal-immigrants’ are being used as proxies to avoid coming to grips with the Bush Administration’s duplicity and for some to supply cover for its bankrupting the country, politically, internationally and economically. a. Who does it serve? b. How does it do so? c. Who is made to suffer as a result? a. What aspect of the U.S. imperial policy in Latin American does unbridled immigration serve? b. What aspect of U.S. corporate policy at home does uncontrolled immigration serve? c. Who must be made to suffer so that ‘adequate’ profits can be made and Americans can continue to have exciting shopping experiences? d. What profits will be considered ‘adequate’ by that 1% of the U.S. population which now controls 33.4 % of the total wealth of the U.S. ? e. Can our present economic system exist without this inequality that it is based on? Even more specifically, can this system we have and applaud, continue to exist without ‘mining’ that inequality, injustice and exploitation of our own and other peoples? If it can exist without such injustices why hasn’t it done so in the past? Why isn’t it doing so now instead of inventing wars, fostering and allowing uncontrolled immigration, and destroying the American economy by ‘mining’ the least wealthy people obtaining mortgages? If we can answer any portion of these questions or any relationships between them we can come to at least a rudimentary understanding not only of ‘illegal immigration’ but of many other related matters besides. The United States has dominated Mexico , Central and South America for more than 150 years, annexing their lands, destroying their economies, bullying, subverting or actually killing their leaders as they sought independence. 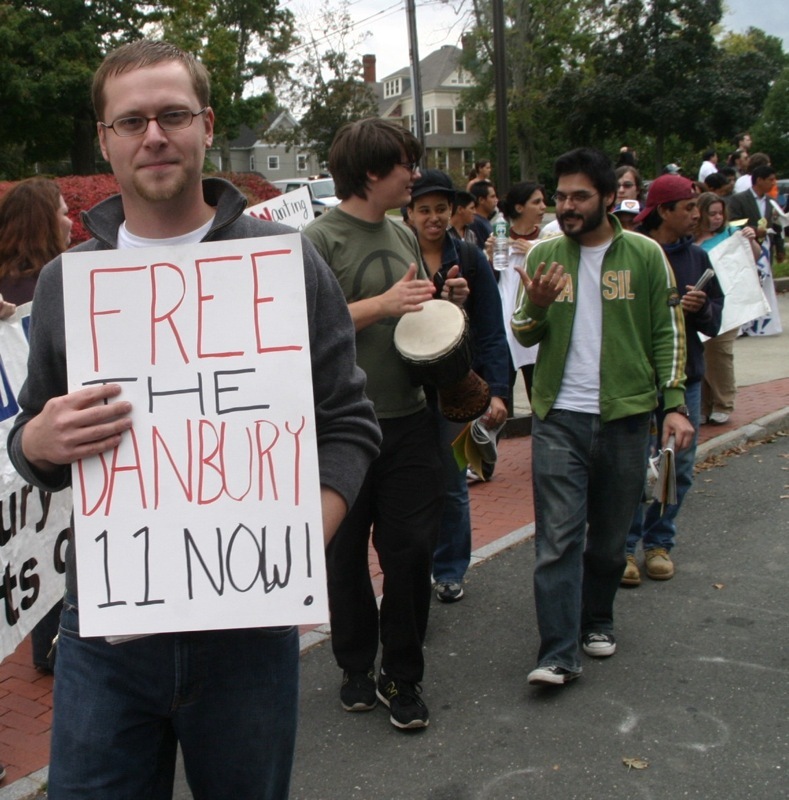 Mayor Boughton who was a former Danbury High School social studies teacher knows this history intimately—or should. For him to be leading another assault on these people instead of attempting a just resolution of their circumstances grotesquely dishonors his profession as well as his community. This every-mayor-for-himself approach is bound to increase not decrease the lunacy of U.S. immigration policy. ‘Illegal-immigration’ is the result of these desperate people forced off their lands into Mexican cities and penury or to become cheap labor for U.S. corporate manufacturing along the U.S.-Mexico border. Some 75% of the Mexican population lives in poverty, 1/3 in extreme poverty while our transnational corporations are allowed to pay below subsistence wages to its young men and women. You don’t hear the anti-illegal crowd talking about these issues. It is profoundly and perniciously unjust for citizens or government officials to seek punishment of immigrants forced here by the catastrophic effects of U.S. imperial policy. Immigrant ‘illegality’ is a direct result of those policies, our government’s policies, which attempt to dominate Latin America affairs. Policies we neglected to oppose, buying in to Clinton ’s propaganda and the supposition it would generate American jobs. It has actually generated more corporate wealth and preposterous executive salaries than everyday American jobs. Immigrant ‘illegality’ is also forced by a U.S. government policy that does nothing to prepare and enforce a fair and honest guest worker program. The very basis of such a program would be a legal and safe means for them to enter for work and return home again. This has not been done for all sorts of reasons the most likely being that exploiting workers is much easier without government oversight. The whole of U.S. citizenry may now be able to appreciate this condition since it has become obvious that lack of government oversight over the sub-prime mortgage industry has brought or may shortly bring, our whole economy to a standstill. We are now in the midst of learning that there is no such thing as a ‘free market’ a condition to which ‘illegal immigrants’ can attest. They are only ‘free’ for the contractors and corporation who make use of them. They are not free themselves. They are forced to work at the lowest possible wages or none at all since they have no redress if their day contractor simply refuses to pay them. There are only markets without government oversight which allow whatever dishonest, greedy tendencies wealthy individuals devise. ‘Managed markets’ that might someday be ruled by fair and decent public policies exist only in the far distant future. Citizens who don’t know and understand the history of U.S. policy in the Americas should educate themselves instead of merely ape-ing Lou Dobbs and his underlying exclusionist propaganda. He is building his career on the backs of victims. The statistics are always inflated and demeaning. Members of his staff have already complained he never seeks information contrary to his anti-immigrant opinions and when presented with any, refuses to consider it. What is remarkably strange is that in some matters Dobbs seems to support labor policies. In many immigration instances Dobbs merely launders racist and malicious lies by providing links to the likes of John H. Tanton the founder and/or funding source for 13 anti-Latino groups. Tanton, a retired Michigan ophthalmologist, has nearly single–handedly created the anti-immigration ‘movement’ to promote racist conspiracy theories, white supremacist and bigoted organizations. Tanton’s groups include his funding arm U.S. Inc., and FAIR , Federation for American Immigration Reform, the largest and most well-known anti-immigrant organization, A spinoff is CIS, the Center for Immigration Studies. By assertive lobbying and working its political connections CIS has received a six-figure contract from the U.S. Census Bureau. 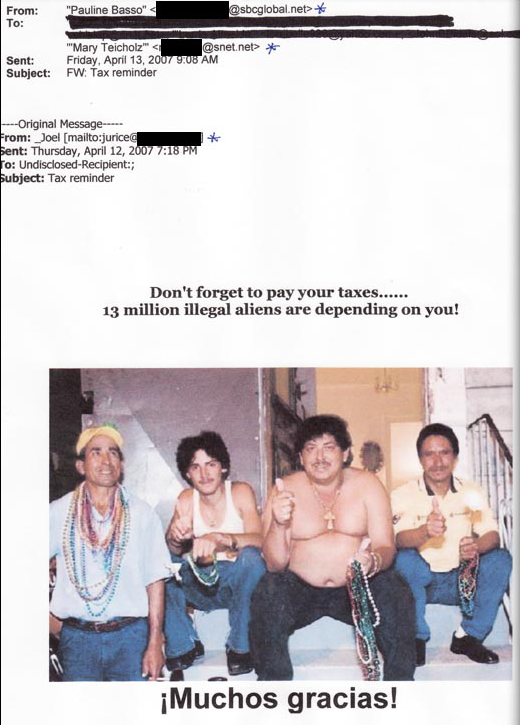 Letter writers to the News-Times have used this resource, obviously without any investigation, in their continuing attack on illegal immigrants. U.S. Inc. receives millions of dollars from a handful of donors and far-right foundations including those controlled by the family of Richard Mellon Scaife—of Clinton impeachment fame. Mellon is the family name of Gulf Oil and Pittsburgh steel and banking monies. Drilling down to the wage scales of the immigrant countries is enlightening. For example the basic basket of necessities for an average sized El Salvadoran family of 3-4 people is 1260 colones ($148.84) per month. This is considered ‘abject poverty’ by the Salvadoran government. Workers at Doall Enterprises make $0.60 per hour which is 1/3 the cost of living to make Liz Claiborne, Perry Ellis and Leslie Fay clothing. The National Labor Committee calculated workers were paid $0.74 for every $198 Liz Claiborne jacket sewed. Other labor conditions are as equally oppressive. In Honduras at Star, SA owned by Anvil of the U.S. , employees work 11 and a half hour days, four days a week. They are paid 786 Lempiras ($41.60) per week or if fast enough (‘100% efficiency’) 980 Lempiras ($51.85) per week. Lunch in the cafeteria is 12% of income per week. 90% of T-shirt production goes to Nike or Anvil. There has been a great deal of turmoil at the factory as workers have tried to organize. In Mexico Alcoa workers are paid $1.21 per hour. Many sell their blood plasma twice a week to obtain money to stay alive. They are being continually harassed with the threat that the company “can hire three Hondurans for one of them.” June of 2005 Alcoa announced 6,500 layoffs which observers expected to occur in the U.S. and Mexico . In the ZIP Porvenir free trade zone, Alcoa is truly free. It is exempt from income, provincial and municipal taxes and all import and export duties. Alcoa’s Honduran wage advantage was $0.61 per hour, 26.75 per week until April 2005 when the Honduran government mandated a 12% increase in minimum wage. That resulted in a $0.68 per hr. wage, $38.31 per week with bus transportation at $0.53 per day and lunch at $0.80 per day for a total of $7.98 per week or 23% of the weekly wage. No workers in the free trade zone are allowed to organize. All attempts result in police suppression and/or firings. In Columbia thousands of peasants have been forced off their lands by palm oil and ethanol corporations under the co-chairmanship of former Florida governor Jeb Bush. Where do the ‘anti-illegals’ think these people are going to end up? Meanwhile the Bush Administration has awarded Halliburton/KBR $385 million in contracts for migrant detention centers along the U.S.-Mexican border. This highly touted physical and electronic border fence is estimated to cost between $2 billion and $9 billion depending on who you ask. Or $60 billion over 25 years to build and maintain. It has already cost $6.8 million after a high tech unmanned border patrol plane crashed in April of 2006 after less than a year of use. These amounts plus some Iraq war refunds and shorting $70 billion worth of corporate farm subsidies could substantially reduce whatever actual social costs of medical treatment and child education American communities expend on immigrants. They could probably provide tickets home occasionally. Turning over local jurisdiction to or conspiring with an ICE which is known to use Gestapo tactics in breaking down peoples doors and terrorizing them in the middle of the night is not a valid function of an American municipal police force. It cannot and will not ease the spiraling effort to find a scapegoat for U.S. economic troubles. Since these troubles cannot be laid at the feet of the many immigrants of the past, the Latinos must be fingered for the scapegoats of the present hysteria. Using a scapegoat allows those portions of the public who need them to avoid facing the overpowering and obvious conclusion that our government has not only failed us, it has betrayed us as a people and our democracy as a decent system. Scapegoats are always a means to distract and redirect public animosity toward targets that will obscure the real powers responsible for the despicable actions and the mistreatment of peoples. It is a sure device to maintain a governing class in power. The FBI reports a considerable increase in hate crimes against Latinos since 2003. We are sowing a seed for a terrible harvest unless we prevent it. These are immediately desperate people who are given no reasonable and timely means to be granted work permits. Many would gladly go home regularly if they could do so safely. It is an utmost distortion to label them ‘illegal-aliens’ as a triumphant characterization of these unfortunate people. Any examination of reality and the foregoing material reveal the injustice being advocated under the rubric of a misplaced legalism. As Americans we dishonor ourselves by such stratagems and unjust devices. Finding a way for these people to work where they are obviously needed and to return home safely or work for citizenship to remain is the justice we need to evolve. Before leaving this discussion of our poorest immigrant workers it is worth considering how well off we are ourselves. The economic information provided here is called the Gini Index of Income Inequality. It is a summary index measure of inequality revealing how far from perfect equality a country is. 0 is perfect equality (all households or families would receive an equal share of national income,) 1 is perfect inequality (one household or family would get all the nation’s income.) Below is the distribution of U.S. income for the years listed. Quite obviously we have been moving away from a greater equality for more than 30 years. Many know it but few understand it. Fewer and fewer families receive more and more of all the income that is to be had. Michael D. Yates. Naming the System. Inequality and Work in the Global Economy. New York , Monthly Review Press, 2003. p. 45. Southern Poverty Law Center . Intelligence Report. The Puppeteer. Throughout. National Labor Committee website, Doall Enterprises. Ibid, Auto Parts: Mexico , Central America , China . The Race to the Bottom: From NAFTA to CAFTA, throughout. Ibid, Mexico , Alcoa Sweatshops in Honduras , throughout. Food First Backgrounder, v13, No. 4, Winter 2007. New York Times, Oct. 30, 2006 A24. The Hightower Lowdown, v. 10 No. 1 Jan. 2008. The Hightower Lowdown, v. 8 No. 7 July. 2006. The William J. Knight Foundation was recently awarded $10,000 from the Union Savings Bank Foundation to support its summer computer camp and after school tutoring programs in Danbury. 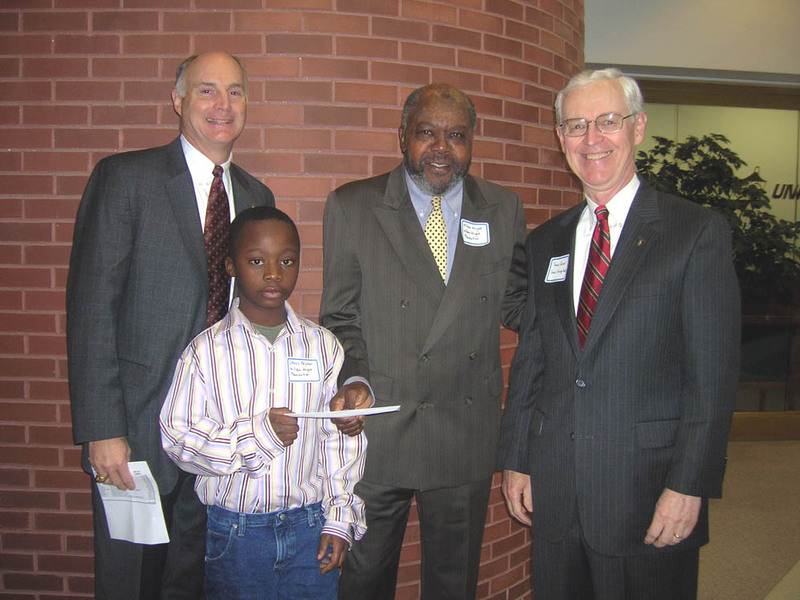 Pictured from left to right are John C. Kline, president and CEO of Union Savings Bank, Lexus Payton, a 2007 summer camper sponsored by William J. Knight Foundation, Knight Foundation Executive Director William J. Knight and Thomas Frizzell, chairman of Union Savings Bank’s Board of Trustees. Photo and caption courtesy of Union Savings Bank. My favorite bank in the area, Union Savings Bank, recently announced that they have distributed a number of grants to several non-profit groups in the Danbury area. As part of its continued commitment to the community, the Union Savings Bank Foundation recently announced grants totaling $134,300 awarded to 16 area not-for-profit organizations that provide adult education and skills training, youth education, pre-school enrichment, housing repair for the elderly and counseling support, among other services. "We're pleased that the funding we've provided to local organizations for 2007 represents a 9 percent increase compared with the Foundation's distribution of $125,050 in 2006," said Mary Ann Frede, chairperson of the Foundation's allocation committee and corporator of Union Savings Bank. The Foundation's 10-member grant committee, comprised of corporators, directors and senior managers, reviewed nearly $275,000 in requests from 35 organizations this past fall. Grant applications are evaluated based on the importance of the program in the community, the program's actual contributions to the community, and financial need. In addition to contributions from its foundation, Union Savings Bank contributed nearly $600,000 to 552 local organizations last year. One of the Foundation's grant recipients, the William J. Knight Foundation (WJKF), sponsors free summer camps for inner city youth in collaboration with the City of Danbury Housing Authority. "I feel blessed and honored that Union Savings Bank has chosen to provide funding to WJKF, which will support administrative and marketing initiatives that help us serve more young people," said Executive Director William Knight. 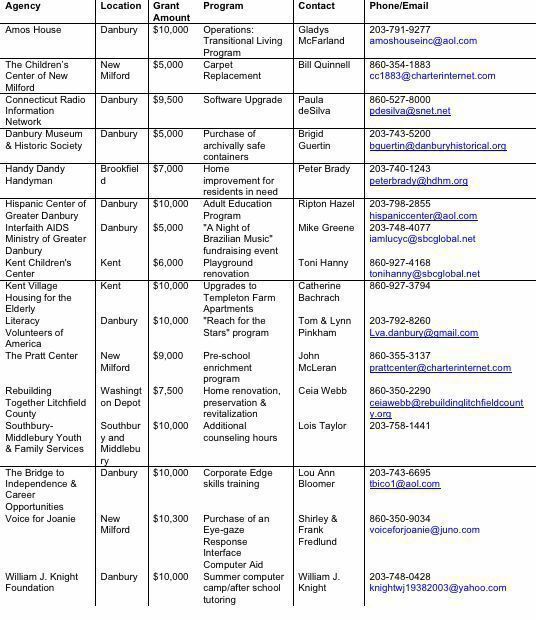 Here's a complete list of the agencies which were awarded grants. That's the aproximent number of people from the immigrant community who came out to the Brazilian Catholic Center to voice their anger with Mayor Boguhton as voice their concerns regarding the ICE ACCESS proposal. What struck me the most was the amount of people who packed the building as I haven't seen anything like that since the marches of 2005. It took some time but I was able to count the people on the second floor by counting the amount of chairs per row and doing a basic head count of the people standing up. Unfortunately, when I finally made my way downstairs, the meeting was basically concluding so the people in the image isn't really reflective of all the people who were originally there I should have taken the photo when I first walked into the building). Also, the picture of the bottom floor doesn't show the people on the far left of the image. • With all these people there, for the exception of one, why didn't any members of the Common Council (primarily those who ward represents the Center) show up and listen to their concerns and help clarify some points? • Where was the News-Times? 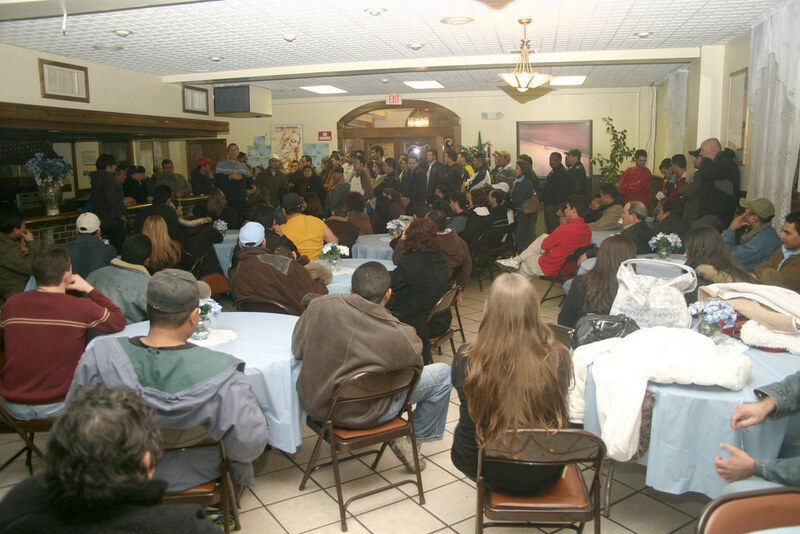 • Why did Tribuna host another meeting at the Women's Center AT THE SAME TIME as this meeting? 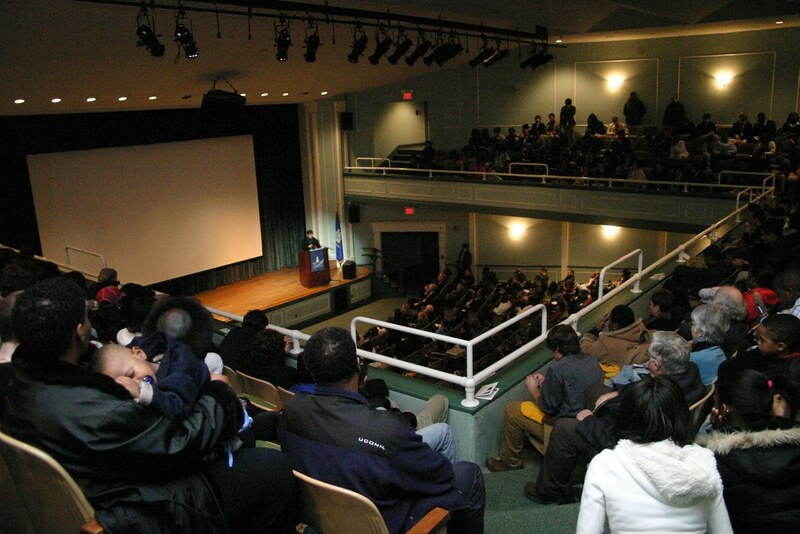 • If the mayor is suppose to represent ALL the people of Danbury, why didn't he show courage and address the audience? Surly, a person who is head of the city could have reached out to the organizers and AT THE LEAST requested to address the people before OR after the panel discussion. As usual, I videotaped the entire event but I'm wondering whether or not I'll even post it on this site and rather hand my material over to the Comunidade News (who primarily organized the event). I might post highlights of the meeting later. Tonight on the local access show Ideas at Work and Beyond, I will be broadcasting my video footage of the Martin Luther King Celebration featuring keynote speaker Carlotta Walls LaNier. For those who don't know, LaNier was a member of the "Little Rock Nine," a groups of African-Americans who paved the way for the full desegregations of schools back in September of 1953 at Little Rock Arkansas. This could be Stetson Place all over again (ugh). It's official, Waterbury Mayor Michael "Jar-Jar" Jarjura is totally batshit crazy. That's the only way to explain his latest bonehead move to propose hiring disgraced John Rowland as the city's economic development coordinator...with a salary ranging between 90 to 120,000 DOLLARS PER YEAR! Convicted former Gov. John G. Rowland would re-enter public service under a newly created Waterbury economic development coordinator position proposed Monday by Mayor Michael Jarjura. Jarjura, a Democrat, confirmed to The Courant Tuesday night that he has made "an executive decision" to offer Rowland a job that would be created under a proposed agreement between the city and the Waterbury Regional Chamber of Commerce. Calling the proposal "my idea," Jarjura said that Rowland, a Republican now living in Middlebury, was the only candidate he interviewed, and that he hopes details can be settled so the former governor can start work within "a couple of weeks." • Come out and get thrown a high paying job from your hometown buddy. I thought no one could beat Mayor Boughton's hiring practices but Jar-Jar proved me wrong. Update: Here's more on this boneheaded idea from the mayor of one of the most corrupt cities in Connecticut. If former Gov. John G. Rowland's appointment as Waterbury development czar goes through — and there was no sign Wednesday that it wouldn't — he again could find himself at the center of the kind of big-money deals that proved to be his undoing in office. The Waterbury business and political interests behind the Rowland appointment say the convicted ex-governor is thoroughly reformed and particularly suited for the position. But others outside the city say that even the offer of the job is a public insult. What's more, they say, it would be a mistake to reinsert Rowland into a mix of money and influence that proved in the past to be an irresistible temptation. "This is a disgrace," said Farmington Town Council Chairman Michael Clark, a Republican and the former FBI agent who supervised the investigation that led to Rowland's imprisonment in 2005. "It is like kicking sand in the eyes of every hardworking taxpayer in Waterbury. He violated the supreme trust — the trust between an elected officeholder and the voters. "John Rowland says he has had a spiritual rebirth," Clark said. "Well, the spiritual rebirth I want to see is when he puts his hand on a Bible and promises to tell the whole truth to a grand jury, honestly and completely, which he has never done." For those who are not keeping score, here's the background on why John Rowland is the most disgraceful politician in Connecticut (and should STILL be in JAIL). The proposed position, conceived by Mayor Michael Jarjura and financed through city and private business money, would make Rowland Waterbury's chief pitchman — selling the city to developers and businesses that, ideally, would construct buildings, create jobs and inflate a moribund tax base. That, critics said, could make Rowland the nexus between developers willing to take a chance on risky urban development and the alphabet soup of state and local agencies and quasi-public financing boards that can provide millions in tax breaks, loans and outright grants to offset the risk. It was just such a meeting of politics and business that proved legally toxic to Rowland. He resigned as governor in June 2004 and was sentenced to a year and a day in prison in 2005 after pleading guilty to conspiring to collect $107,000 in gifts and services from businessmen who got hundreds of millions in contracts and tax breaks from his administration. Rowland's new job would be "very much involved in politics and economic development — and isn't that the reason why the governor got into his problems in the first place?" House Speaker James Amann, D-Milford, said. Amann said Rowland, a Republican, backed Jarjura in 2001, when Jarjura narrowly won the Waterbury Democratic mayoral primary. "He's loyal, and he remembers," Amann said of Jarjura. "I am not knocking him for trying to help out an old favorite son of Waterbury — but I just don't know why it had to be this particular job." Well, if anyone knows a thing or two about "political loyalty," it would be Amann (cue Lieberman). One of the reasons many in the immigrant community are against the ICE ACCESS program centers around their dissatisfaction with the police department. Although the media reported on the cases involving police who allegedly used racial slurs and roughed up teens at last year's carnival or the alleged beating of Jacob Kramer, tales of police harassment against the immigrant population either goes unnoticed or even worse, applauded by the anti-immigrant establishment. In honor of the recent statements from the disgraceful local embarrassment Joel Urice, (Republican member of the planning commission) I felt it was necessary to understand the type of individual we're dealing with before we start our new campaign and bring attention to the new round of CRAP misinformation that's being peddled by himself and Lynn waller in terms of illegal immigration. 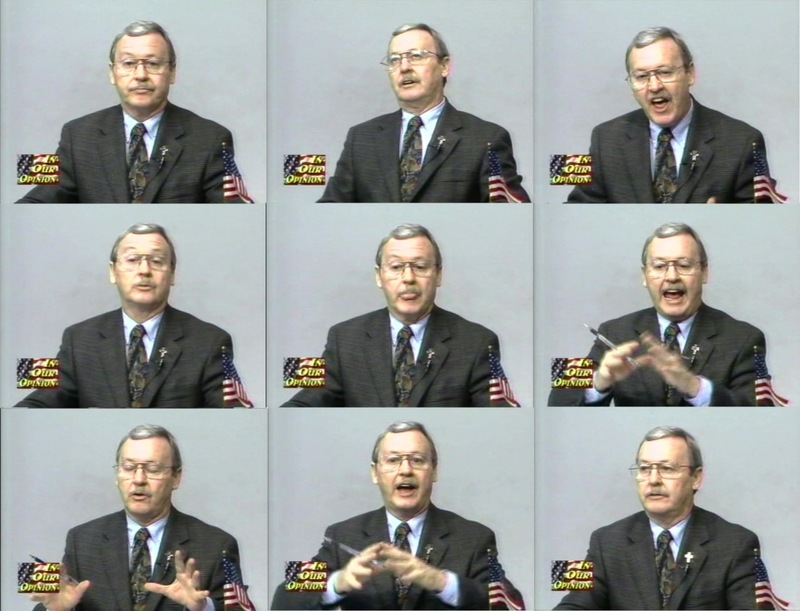 Since his downfall after his racial intolerance was exposed to the public, Urice has been on a tirade mocking News-Times columnist Brian Koonz as well as people who don't agree with his twisted views. He, with the assistance of Lynn waller, has spread a laundry list of lies that has until now, gone unchallenged...and that's about to change on a national level. Since the video doesn't lie, take a look at this old post from late 2007. 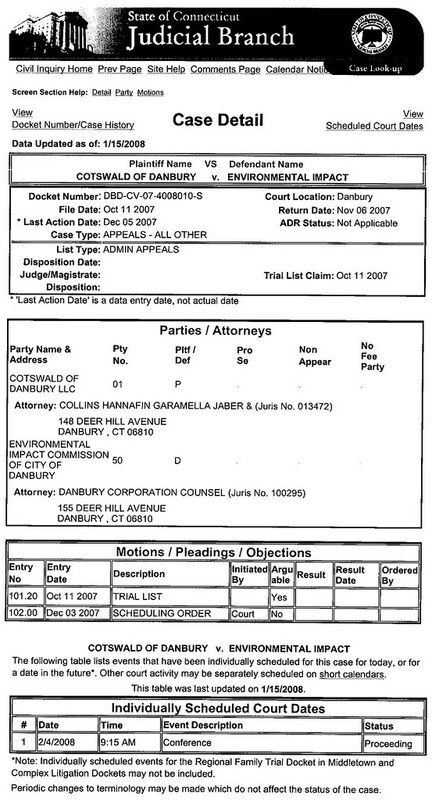 It's almost been two weeks since Planning Commission member Joel Urice and Republican Majority Leader Pauline Basso were caught forwarding racist and inappropriate emails, which sparked outrage all across Danbury and throughout the state of Connecticut. Of all those involved in this matter, Joel Urice is by far the most arrogant and shameless and his level of insanity was on full display Friday night. In a rant that hopefully seal his and Pauline Basso's political fate, instead of showing any level of understanding that his so called "jokes" caused harm among a majority of the community, Urice spews an irrational tirade and criticizes those who brought his ugliness to light. Note to the cowboy: A great way to stir the pot is by calling those you consider critics as THOSE FOLKS. I know it’s rather difficult for you but try to remember that you're living ABOVE the Mason-Dixon line. Are you following this moron's logic...lets continue. For the last few weeks, I've been traveling around the city talking to members of the immigrant community about their opposition to Danbury's participation in the ICE ACCESS program. In short, there is a lot of anger in the community directed to Mayor Boughton that, unfortunately, is going unnoticed. To give them a voice, I recorded clips of people who I interviewed and they expressed their bitter anger over the mayor and this proposal. I also talked to many who are becoming increasingly angry over the lies, bigotry, and racial intolerance from those in the anti-immigrant community. Given the recent events of violence against two immigrant right community activists, this whole ordeal has the potential of blowing up like a timebomb so I think it's important to document the frustration so when all hell breaks loose, no one wil be surprised. These clips will include only one interview at a time so make sure to come back to see more comments from those who are being ignored. If you missed last night's Martin Luther King Community Celebration ceremony at Western Connecticut State University, you missed a truly moving experience. The keynote speaker, Carlotta Walls LaNier, gave an incredible speech and hopefully our younger generation will have a better idea of what LaNier went thought as one of the nine black students who intergrated at Central High School in Little Rock Arkansas. Thanks to those who organize this event as they did this city proud. A special thanks to PJ Leopold who really hit the nail on the head with her words and linking the struggles of the 50s with the struggles of today in Danbury. Here's a few photos from last night. Video footage of the event will be posted shortly and I'll bump this post to the top once everything is uploaded. If you were in attendance last night and wish to comment, please do so in the comments section. UPDATE: Here's the text to PJ Leopold's remarks that received a huge applause from the audience. First: they’re not just over Rights, but are over National Values getting sorted by local communities. In the Civil Rights Movement: Water Fountains and Restaurant Counters started as local issues. In Montgomery, Alabama, what went on to change the entire American transportation system, started – with a local person: when Rosa Parks sat down, a nation of New Values was lifted up. African American men used to be called “boy:” branded inferior, because of skin pigment. For many families, issues of race now couple with language or accent. If Martin were here tonight, I believe he’d see abilities of Hispanic, Latino, & Brazilian children to speak 2 or 3 languages as marks of early-childhood intelligence, not their inferiority & perhaps he’d mention many nations teach a 2nd language from the first day of school because they don’t de-value it; and instead, see an asset to build on. Water Fountains & Buses, or NEW struggles over: language, visas, law enforcement. All come back to Local Communities, getting rid of the clothes in the closet that no longer fit. The use of fear & hate. These were huge challenges to the Civil Rights Movement. Rev. King. Andrew Young. Rosa Parks. Barry Goldwater. Archie Bunkers. Names have changed. But reducing many, many complicated issues to the “I-Word” (Immigrant automatically equals Illegal) is spreading fear and hate, to dangerous levels. Let us fight passionately & unrelentingly for the goals of justice and peace, but let us never fight with falsehood and violence and hate and malice, but always fight with love, so when the day comes that the walls of segregation have completely crumbled - we will be able to live with people as brothers and sisters. When Martin’s message is in your heart, your Values rise above using fear and hate and you discourage its use by anyone in the community. To briefly pause there: inside your program, there’s a Card -- to join the Rapid Response Network. It’s a confidential list maintained at the Association of Religious Communities. It’s not given to any other agency & not used for fundraisers. It’s only used to contact you, if there’s a need to help a victim of hate. Signed cards will be received at the Exit, by The Ushers (thank you Ushers). A third and final link: ……. The Civil Rights Movement produced New National Values by asking good questions. The greatest of all was 1 word: Why? Why do water fountains need to be segregated? Why not integrate? Martin was a Preacher. Not an Engineer. I doubt he knew how to “build water fountains.” What he knew, was how to ask questions – to change the Fountains of Compassion & Fountains of Achievement – for all people. And then, new waters began to flow. Recently, several thousand residents were polled: asked to “press 1 or press 2” on a Law Enforcement Proposal (commonly called) ICE ACCESS. Advocates say the program won’t involve “racial profiling.” Yet, the policy would permit police to conduct searches and arrests without warrants; so sometimes police wouldn’t have any choice but to do their job based on what they “see”: physical attributes, such as race. Let’s say a survey was mailed with the option to “check 1 I’m for segregation, check 2 I’m against” – AT THAT TIME, how would that’ve worked out? (PAUSE) And where would Civil Rights be today? On Feb 4, 1968 in Atlanta, at Ebenezer Baptist, in response to being called a GREAT American, Martin said this: Everybody can be great. Because anybody can serve. He said: You don’t have to have a college degree. You don’t have to make your subject and verb agree. You don’t have to know Plato and Aristotle. You only need a heart full of grace. A soul generated by love. Everybody can be great. Because anybody can serve. We all owe it to Rev. King, to start a NEW page in history where people of very different outlooks can come to the same table with one, common Goal: what to do (or not do) to bring the community to -- a higher level of Greatness. And Free, Free at last -- to live, work, worship, and study – in harmony. But working together, we can get rid of clothes in the closet that don’t fit (pause) and once again set our eyes on Promised Land. Thank you Event Planners and Thank you All, for a Great Night. We're almost done compiling Mayor Boughton's campaign finance reports and you're in for a real treat. The response from people who have gone through the names and numbers has been tremendous but we're giving people one last time to download these reports and give it a look through. Other media outlets have shown an interest in who's who on Boughton's report so we want to make sure we dot every "I" and cross every "T" before going public. Some people have some explaining to do...let's work together to expose the ugly truth. If you find any campaign donations of interest, please email your concerns to hatcityblog@yahoo.com and we'll look into it. UPDATE: Had to fix the link to the latest report. File is now available.